It seems almost a paradox, or perhaps just an anachronism, to suggest that it is possible to describe the global situation from the vantage point of the state. Flows and scapes, transnational corporations, migratory movements, financialization, supply chains, the “unholy trinity” of the World Bank, IMF, and WTO – these are the actors, processes, and entities to which analyses of the global most frequently refer. Overwhelmingly the focus has been on operations and dynamics that in some way exceed or displace state power and borders. So much is this the case that arguments about the decline of the state have become predictable and overfamiliar. Particularly in the early heyday of globalization talk in the 1990s, these perspectives were so common that they prompted an opposite and reactive argument – that the state continues to dominate the global political landscape, and claims about its decline are both inflated and misguided. This argument gained traction in the wake of growing security concerns in the first decade of this century, particularly among scholars and political actors who considered discussions of globalization to be more discursive and rhetorical than actual developments warranted. Thankfully, we now have more complex accounts of how globalization has changed the state from within, and of the roles played by states (some more than others) in fostering globalization1. Although we agree with these arguments, our point in this essay is different. Moving beyond discussions about the decline or maintenance of the state, we critically interrogate the very baseline model of the state that has thus far informed arguments about the changing position of the state in capitalist globalization. Our argument evolves both in dialogue with and reaction to the wide debate concerning the transformations of the state in the most recent waves of capitalist transition, restructuring, and disruption. The very unity of the state has been at stake in this debate. The prominence of arguments about governance and the governmentalization of the state is one register of a widespread approach that highlights the disarticulation of the state and its functions, by calling into question the unity of the institutional system and political body of the state. In contrast to these approaches, there has emerged an equally prevalent series of arguments that tend to take the unity of the state for granted, but point to powerful and more or less enduring instances of exception that both underlie and undermine the classical narrative of state sovereignty. Although these lines of argument are often opposed and have given rise to reams of polemic and compromise, we tend to see them as complicit. While the first line of argument points to the stripping away of powers from the state and the rise of new political, legal, and territorial assemblages that blur the boundary between economic and political forms of rule, the second sheds light on the blind spots of this approach. In our book Border as Method 2 we have forged the concept of the sovereign machine of governmentality to grasp both the salience of processes of governmentalization and the mutations of sovereignty beyond the state. The conceptualization of the state within imperial visions of globalization that highlight decentered forms of sovereignty and mixed constitution has provided an important advance in discussions of the shifting relations between the state and capital.3 This framework continues to provide a guide rail for critical analysis of the present global predicament – but there is a need to assess the role of the state within an altered landscape marked by experiences of war, crisis, and persistent turbulence. This unstable global situation cannot be fully apprehended within the classical framework of unilateral and multilateral international relations. The changing status of territory and its relation to juridical regimes of territoriality has complicated questions of jurisdiction and pushed constitutional arrangements well beyond the administrative and geographical limits of the state. From a perspective that highlights the global dynamics of capital, the effects have been by no means consistent. Persistent processes of financialization have shifted the scale and techniques of regulation in ways that extend beyond any single national economy. The US-based architecture of globalization has weakened its grip on the world’s circuits of capitalist accumulation and monetization, particularly in the wake of the economic crisis of 2007-8. Ambitious global plans such as those developed within the framework of the WTO have given way to more modest regional and oceanic visions for the projection of US economic power (one thinks for instance of the Trans-Pacific Partnership or the Transatlantic Trade and Investment Partnership). At the same time, new economic nationalisms have arisen to counterpoint these visions and suggest alternative patterns and paths of global ascendency. One thinks of the activities of China in Africa, Latin America, and even Antarctica. The presence of the state in these divergent patterns of global expansion is manifest, even if it relates to entities such as the market or the political party in specific ways. From India to Japan, Brazil to Russia, South Africa to Germany, states have made tangible investments that shape and enforce variable geometries of economic expansion and development. In doing so, they have entered into shifting arrays of power in which their relations to populations and strategies of governance have changed in multifarious ways. They have also been compelled to come to terms with a regime of capitalist accumulation that is increasingly characterized by the primacy of finance and by what we have described elsewhere as “extractive” operations of capital.4 The question is how much, in these reckonings with capital, states themselves have changed. To come to terms with the new roles and forms of the state it is necessary to account for the global scale of processes and dynamics that disrupt established political as well as economic geographies. The crisis of US hegemony, carefully analyzed by Giovanni Arrighi5, provides an important interpretive background for these transformations. The persistence of war (with the shattering of colonial and postcolonial boundaries in the Middle East, the tearing apart of the Ukraine, or the struggles over vast stretches of land in Africa) is an important part of this scenario, in which the overwhelming military power of the US does not seem to provide any kind of stabilization. The emerging formations and deformations of the state in these war-ridden territories deserve a more detailed investigation. At the same time, the current global predicament cannot be described in terms of an impending linear hegemonic transition. The emerging landscape of power at the world scale increasingly abides a diffuse and multipolar, or even “nonpolar,” pattern. Although some of the most crucial contemporary operations of capital, (for instance in the fields of finance, logistics, and extraction) are characterized by a high level of homogeneity, the ways in which they “hit the ground” are profoundly heterogeneous. The juncture between the global operations of capital and their specific and grounded instantiations provides an important point of entry for the analysis of the contemporary mutations of the state. States are crucial actors at this juncture, but they are far from being able to claim a monopoly in its management and overseeing. They are rather compelled to negotiate their role with a multifarious array of agencies and reckon with heterogeneous legal orders, logistical protocols, financial algorithms, and monetary arrangements that exceed the control of any state. These negotiations and reckonings also contribute to the longstanding tendency toward a prevalence of the executive and administrative branches of power within the state and a marginalization of its representative bodies. This is clear even in important experiences such as those of Latin America’s new “progressive” governments in the last decade, where the celebrated “return of the state” has been made possible by an intensification of extractive activities and by the dynamics of the global market for commodities. The contemporary state is far from being autonomous, and it is important to point to the limits of its action in order to counter the easy optimism surrounding for instance the above-mentioned discourse of the “return of the state” in Latin America. We are convinced that there is also a need to move beyond the focus on the “negative” stripping away of state functions and capacities that has characterized many critical discussions of the state in globalization. Whether the focus is put on the rolling back of welfare, the destabilization of the state monopoly on violence through the rise of private security actors, or the multiple and widespread techniques of privatization that have altered the state’s position in matters of ownership and economic activity, the overwhelming tendency has been to conceptualize the state in relation to that which has been subtracted from it. Mainstream critiques of neoliberalism, whether this is understood as an economic doctrine or a governmental technique, have only entrenched this tendency. What we propose is a more “positive” description (positive in analytical terms) of what states are doing nowadays without presuming to know already what the state is or might be. In other words, our approach differs from a normative understanding of the state – both in terms of a qualitative appraisal of its supposed capacity to deliver order through regulative or legal means and a juridical framing of its activities, relation with subjects, and indeed very founding. Focusing rather on what contemporary states are doing leads us beyond the boundaries of traditional state theory, which is shaped by these normative assumptions. As we show later in this article, such assumptions are usually predicated on a particular historical genealogy of the modern state with precise geographical correlates. Opening alternative historical archives, which are not necessarily limited to the rise of a standard state-form, provides a way to shift both conceptually and empirically grounded approaches to the state across different scales and frames of reference. This is a problem that does not only concern traditional juridical theories of the state, or the variegated elaborations of the immensely influential Weberian ideal type of the modern territorial state. Different historical genealogies and alternative archives also allow us to frame in new and productive ways debates about the crisis of the state that have unfolded since the 1970s. To speak of a crisis of the state is elusive, since a long debate surrounding this claim extends at least from the late nineteenth century. International law, increased internal social pluralism, imperial entanglements, and processes of organizing capitalism all contributed to this questioning of the autonomy of the state and its capacity to exercise an absolute sovereign power. Nevertheless, for most of the twentieth century, the state remained intact and maintained a dominant position as a world political actor, through wars, economic crises and growth, struggles of decolonization, and the expanding administration of social life. It was only in the late 1960s/early 1970s that amid tumultuous social struggles and unprecedented economic changes this dominant position was tested and challenged. Particularly in the North Atlantic countries, a fiscal crisis of the state was matched by a crisis of legitimation. This double crisis registered the growing difficulty of the state in framing the reproduction and socialization of labor power, which had been a key aspect of its activities at least since the economic shocks of 1929. In his important chapter on the working day in Capital, Volume 1, Marx had already pointed to this function of the state. As the state confronted increasing barriers to its regulative function in the 1970s, the socialization of labor power became inextricably linked to processes of subjectivation and struggle that neither capital nor the state could contain. Wolfgang Streeck6 has stressed the importance of the neo-Marxist debate on the crisis of the state in the 1970s, involving such thinkers as Jürgen Habermas, Claus Offe, and James O’Connor. Streeck highlights the absence from this discussion of a deep consideration of the role of the banking system and financial markets in the specific strategies adopted by capital as a political actor and form of social power. Such an absence did not characterize all critical strains of argument that emerged in this period. In the tradition of Italian operaismo, for instance, there was a rapid appreciation of the epoch-making consequences of the delinking of the US dollar from gold in 1971. The new wave and scale of financialization, which figure prominently among these consequences, dramatically changed the very conditions of the reproduction of labor power. They also strategically altered the state’s position with regard to the mediation of the contrasting interests of different “fractions” of capital and to the representation of “total capital” (or the general interest and overall reproductive logic of capital). This latter concept, elaborated by Marx in the second and third volumes of Capital, is not to be understood in reified terms. It rather points to a field of forces and dynamics characterized by instability and elusiveness. Friedrich Engels’ definition of the state in Anti-Dühring as the “ideal collective capitalist” nicely captures the important roles played by the state in the representation of a “total capital” whose horizon has nevertheless always been the world market.7 The operaista discussion of the state in the 1970s focused on the crisis of planning as a strategic juncture between the state’s activities in targeting the reproduction and socialization of labor power (which also means the articulation of capital’s command over these processes) and its labor in the field of the representation of “total capital.”8 While this debate was characterized by a political emphasis on struggles and the transformations of class composition underlying the crisis of the state, there was also an acute awareness of the reactive strategies of capital, at both the national and international levels. The analysis of the crisis of the “planner-state” (Stato-piano) pointed therefore to a set of violent dislocations of the reproduction of labor power and the representation of “total capital,” which in many ways anticipated the trends later discussed in debates on neoliberalism and globalization. Although this narrative of the crisis of the planner-state remains seminal, there is a need to recognize that it is not the only disruption that marks the political and economic turmoil that inaugurates the global era. To fully apprehend the depth and range of the crisis faced by the state since the 1970s, it is necessary to widen the geographical scope of analysis and confront the deep processes of heterogenization that remake political spaces in their tense entanglement with spaces of capital. Planning was a general feature of the state-form that dominated in the period following World War II, although it assumed different shapes depending on political contexts and economic conditions. In quite schematic and abstract terms, it is possible to identify three varieties of state that became prominent in these decades: the democratic welfare state, the socialist state, and the developmental state. It is easy to see how these categorizations correspond to the “three worlds” model of political and economic geography that emerged with the clashes and turbulence of decolonization. In invoking these instantiations of the state, we are aware of the limits of typological analysis and seek only to provide guidelines for assessing the changes that emerge with the triple crisis that affects them all. Discussions of the impact of globalization on the democratic welfare state and the socialist state are rife. For our purposes, it is more interesting to give attention to the developmental state, by which we refer to a huge variety of political regimes and experiences that grew out of state-building processes after the end of colonialism in Asia and Africa or took new forms in Latin America where they confronted processes of industrialization, contested democratization, and persistent conditions of dependence. In these continental contexts it is possible to observe frictions and distortions that marked attempts to match the conditions and struggles of development to the modern state-form. Such fallout shaped the crisis of the developmental state. What attracts our attention is how this crisis foreshadows more general features and trends of the state that would come to the fore globally. The developmental state registered a certain globalization of the state-form that emerged with the containment of anti-colonial struggles and the installation of technical measures and standards by which a state’s progress along a developmental path could be tracked. In this way, the developmental state was driven both by strong imperatives of centralized planning and state-building, and by more regional or international disciplines of economic restructuring and political clientelism. The question of the reproduction of labor power and the state’s position with respect to “total capital” looks quite different in this optic. To put it simply, the attempt to reproduce labor power according to the norm of “free” wage labor was severely limited by the presence of informal, coerced, and mobile labor forces, as well as by household conditions and gender regimes that could not easily be managed by technologies such as the Fordist family wage. In addition, the script of so-called primitive accumulation in developmental states did not easily follow the narrative of transition from agrarian to industrial work, creating myriad surplus populations that could not readily be corralled into standard regimes of reproduction. At the same time, the reality of “total capital” took on imperial and neo-colonial guises, generating comprador classes and weakening the state’s powers of intervention and negotiation. This positioning of the state poses challenges for any attempt to understand the developmental state with reference to the classical Weberian definition of the modern state, with its emphasis on institutional and bureaucratic organization and the state’s successful claim to the “monopoly of legitimate physical force” within “a given territory”9 Such difficulties in matching the developmental state to the Weberian template were not the effect of belated modernity, or deficits to be recuperated through economic growth, but arose from variegated historical and geographical circumstances that would only become more pronounced with the transitions that opened globalization. There is no need here to remember in detail how the crisis of the developmental state was fuelled by and entangled with brutal dictatorships, the suppression of popular political and social power, structural adjustment programs, or hot and cold forms of warfare. Such physical, administrative, and economic violence should figure prominently in any attempt to reconstruct the crisis of the developmental state as well as the struggles and transitions that marked the emergence of new enmeshments of capital and power in the 1980s. Our main concern here is to survey the variegated postdevelopmental scenarios that began to emerge in the wake of the changes, since they are important analytically as well as historically for any understanding of the contemporary state writ large. These vistas of change encompassed the emergence of more flexible political technologies of rule, heterogeneous territorial arrangements, and increasingly decentered ways of mediating the relation of capital to the state. We will reserve a fuller discussion of these transformations for later interventions. For now, we want to suggest that such postdevelopmental tendencies are best understood not as irregularities with respect to a supposed norm or “ideal type” of the modern state, but rather as mutations that adapt to but also spur the tumultuous and asynchronous temporality, expansion, and intensification of contemporary capitalist accumulation. In this respect, these tendencies are by no means limited by the geographical axes of North and South, or center and periphery, which they have largely superseded and replaced with more complex spatial distributions of power and wealth. To recognize this, however, is not to suggest that these arrangements are without historical precedents, which can provide powerful points of reference for an alternative genealogy of the modern state. Theoretical understandings of the state have been shaped by a particular historical account of state formation, which usually departs from early modern Europe. The emphasis falls on how the concentrated power of the monarchy provides the basis for the political form of the modern state, with its uniform and limited notions of territory, subjecthood, and coherently linked administrative bodies. In the wake of the revolutions that spread across Europe and the Atlantic world, there emerged a constitutional state that established a continuity of legal order and firmly embedded the state-form in new arrangements of nation and citizenship. Needless to say, this is an extremely rough sketch of historical processes that have been the subject of many contestations and reinterpretations. Nonetheless, the basic premises of this vision have provided the scaffolding for the construction of many different traditions of state theory – those that build on Marx as much as those that draw on Weber. These premises have also supplied an implicit ontology that has made the question of what the state is superfluous in many debates, including attempts to take stock of the most recent changes to the state in globalization. We would like to question the extent to which this genealogy can adequately facilitate an understanding of the changing shape and roles of the state in the present global situation. If one looks at the historical efforts of European empires to establish effective control over vast stretches of land and populations across the surface of the globe, a different history of sovereignty and power emerges.10 Clearly these imperial ventures must be analyzed in ways attentive to their huge variety, as well as their historical and geographical differentiations. Nonetheless, the model of homogeneous territorial integrity, the construction of systematic legal order, and the vertical diagram of state power and subjecthood do not provide adequate analytical coordinates within which to grasp the extent of these differentiations. Far from being incidental to the history of the modern state, historical research on these complex colonial arrangements and entanglements shows how imperial expansion becomes a crucial moment in state building itself. The European world of states took shape and evolved within such an imperial environment, where the sheer exercise of violence was accompanied by legal and political disputes that would eventually shape the path of global history in ways just as important, if not more so, than the peace of Westphalia. In this perspective the evolution of the modern state does not run directly through the coordinates of nation and citizenship, but instead passes through a panoply of commercial and legal arrangements that a new generation of historians has begun to investigate. The result is a much more fragmented view of the history of the modern state, which we consider to be much richer and more fecund for a critical understanding of the state in the present era. If one considers, for instance, the history of chartered companies, it is possible to see them as body politics in their own terms. 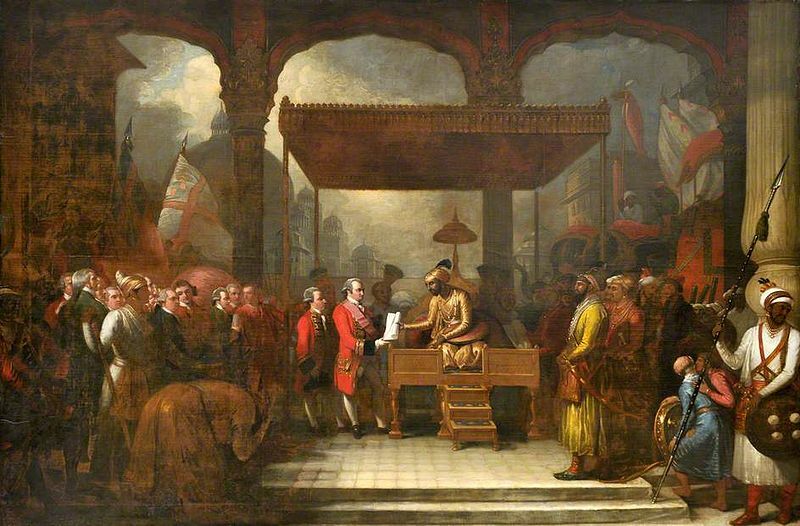 These apparently commercial entities combined features of governments, corporations, jurisdictions, and colonial property to exercise “a precarious but potentially potent form of ‘structural autonomy’ and thus corporate sovereignty” enabled by the volatility of their constitutions.11 In his book The Company State, Philip Stern turns Edmund Burke’s famous disparagement of the East India Company as “state in the disguise of a merchant” into a positive description of its political existence. However, it is not only in the “factories” and outposts established by chartered companies that we can observe this more fragmented history of the modern state. The system of plantations, transport, and ownership that characterized the trans-Atlantic slave trade, as well as the movement of “coolies” and other kinds of indentured laborers, required the invention of innovative forms of territorial power and legal regulation. The establishment of protectorates, concessions, and treaty ports was part of the mainstream of European imperial expansion and created scattered legal and political spaces. From the late nineteenth century, these already complex spaces were further complicated by multifarious deformations of sovereignty, giving rise to a wide array of “quasi-sovereign” and “partially sovereign” colonial polities.12 Moreover, the system of international law, which is clearly important to the history of the modern state, is unthinkable in separation from imperial practices in the Americas, Asia, and Africa. As Partha Chatterjee explains, these practices “had a profound effect in shaping the so-called law of nations, and defining the place within it of the modern sovereign nation-state.”13 Importantly, the evolution of these systems took place in confrontation with heterogeneous forms of political organization – such as the tribute system that structured China’s relation with its dependencies, and the patchwork of rule and influence that characterized Mughal India. When viewed in the light of these refractions of imperial political and legal formations, the postdevelopmental scenario we discussed earlier appears much less “anomalous” than it does when compared with the dominant state forms of the post-World War II era. It is easy to see the similarities between the differentiated geography of colonial rule and subjecthood and contemporary strategies of zoning, graduated sovereignty, multilevel governance, and differentiation of rights. This is the case even though the former was part and parcel of a contested process of territorializing the world, while the current transformations take place within the frame of a territorialized world that is forced to adapt to changing conditions of capital, and thus tests the limits of established notions of territoriality. The range and variety of actually existing states in the present is even more complicated than the bewildering array of political and legal forms present in the colonial era. As Akhil Gupta writes: “All claims about the state” today “should be countered with the question, Which state?”14 Gupta is referring here to India and the confounding proliferation of different levels of government, heterogeneous agencies and bureaus, and the various policies, programs, and people that constitute the state in that context. But his question also has relevance at the global level, where it is possible to observe a dazzling array of different kinds of states way beyond the realms usually identified with postdevelopmental dynamics. One need only think of the wide variety of prefixes and adjectives that populate discussions about the transformations of the state-form today, giving rise to a range of denominations from gatekeeper state to party state, continental state to rogue state, failed state to quasi-state. Far from being applicable only to the specific realities they evoke, these categories provide analytical lenses through which it is possible to grasp some of the changes and trends that are reshaping the state-form at the global level. For instance, there is something to be gained analytically by approaching the UK as a gatekeeper state (mediating the US-centered financial world into Europe) or the member states of the European Union as quasi-states (considering the mixed constitution of sovereignty at the European scale). Moreover, the imbrication of sovereignty and commercial power instantiated by the historical chartered company has assumed new forms and heights in the contemporary world. In the fragmented political and institutional landscape of present globalization the border between state and capital is continuously tested, whether through imperatives of state entrepreneurialism, the direct political power exercised by many transnational corporations, or the role of international agencies in orchestrating political and economic development. Remembering the quip from Edmund Burke cited earlier, we might say today that there are many merchants acting in the disguise of a state. Above we have offered two distinct but interconnected genealogies through which to approach the state in times of globalization: first, we followed the trajectories that break down the developmental state, giving rise to legal and political arrangements that have become increasingly prevalent at the global scale; second, we have focused on the longue durée of fragmented state-forms that develop through the history of modern imperialism and colonialism. Both of these narratives allow us to see something specific about the contemporary state but taken together they highlight the complicated and fractured landscape of present state formations and deformations. Critically analyzing the state nowadays means taking into account this landscape in its widest scope and implications rather than focusing on single instances, or privileging a baseline model from which various empirical changes are measured or dismissed as extraneous to the state. Our main interest is not in the comparative analysis of different states, identified according to the established geographies of the world map, but rather in discerning and following resonances between trends and processes that traverse the state in heterogeneous contexts. In this regard, to come back to a point we mentioned at the beginning of this piece, it is important to look at how states these days tend to meld or be increasingly enmeshed with emerging assemblages or regimes that transcend them. Often these assemblages and regimes blur the boundaries between legal norms, technical standards, and political consensus in ways that facilitate and promote the operations of capital across diverse geographical scales. Recent research in geography and urban theory has given us a new vocabulary with which to describe and analyze these processes of mixing and rescaling – from Neil Brenner’s discussion of state spaces15 to Keller Easterling’s explorations of extrastatecraft.16 The issue of how the state fits into these emerging patterns and scenarios tests our very notions of the state and recasts familiar questions about matters such as political representation, hegemony, civil society, and the role the state can play in contrasting or even taming global capitalist dynamics. For us, grappling with these important questions means approaching the difficult task of examining the state’s deep entanglement with global economic and political forces without reverting to traditional contractual or normative conceptions that imagine they can put the state back in control. In exploring the terms of this entanglement, it should be clear that our position is that states still matter. We have already affirmed that we subscribe to neither arguments that posit the state’s withering away, nor those that in guarded celebration argue that globalization has left its core unchanged. In pointing to a more fragmented history of the state, we do not mean to suggest that such fragmentation is sufficient to ground a theorization of the state. As much as arguments about the governmentalization of the state are useful in highlighting the diffuse operations of contemporary rule over territories and populations, the claim for unity continues to be a defining feature of the state and its contested legitimacy. Indeed, the tension between the disarticulation of the state’s unity and its continued reinstatement defines the field in which the state operates today. There are many different empirical manifestations of this tension, which is evident, for instance, in rhetoric that denies the influence of global forces on the state or on a different level in the gap between the collection and accuracy of statistics and their aggregation into databases that profess to undergird coherent narratives about a state’s growth or destiny. We do not believe this tension can be resolved. Although the nation has always promised the possibility of such a resolution, its ability to deliver this is highly uneven and often dependent on variables that display the fractures in the state that nationalism can be so effective in covering over or filling up. Equally repressive state mechanisms, which with various degrees of intensity and brutality can create the patina of state unity, also show the cracks in the state’s armature. This exposing of cracks can occur through historical excavation that sheds light on the excess and unrepaired wounds of past state regimes, or the sheer audaciousness of continued opposition in many parts of the world, whether organized or spontaneous. States continue to be repressive, for instance in the face of dissent, the testing of their borders by mobile populations, challenges to the workings and discipline of capitalist accumulation, or the unruliness of racialized minorities. Increasingly, however, the repressive work of states, which is classically considered part of their core business, is outsourced to private interests or pursued through the perverse logic of the public-private partnership. Going back to what we wrote above about Marxist discussions of the state, there is a need to stress that globalization has fostered an increasing bifurcation between the reproduction of labor power and “total capital.” It has become difficult for the state, for any state, to provide an effective mediation between them. In its relation with capital the state is compelled to reckon with logics of capital accumulation that largely exceed national denominations and boundaries. In this situation, the state emerges as an economic actor that holds particular relations with specific fractions of capital, whether these relations involve the promotion of national economic interests through neo-mercantilist strategies, or efforts to attract foreign investment through fiscal mechanisms, labor law arrangements, or various kinds of territorial concessions. In making such moves the state does not necessarily act as the “ideal collective capitalist,” to recall the phrase we used from Engels above. Rather, it emerges as one capitalist actor among others, although it may be in a stronger or weaker position with respect to the interests and agencies with which it interacts. “Total capital” today is more a bundle of logics, rationalities, and dynamics in which diverse capitalist actors collaborate and compete, giving rise to powerful alliances that sometimes operate at the continental or even global scales. States are enmeshed in these mixed constitutional relations that make up the only possible approximation of the reality of “total capital” in the global age. Even where the state still plays a role in the reproduction of labor power (for instance through national health, education schemes, or systems of labor market regulation and industrial arbitration), it is understood as a “positive externality” to capitalist enterprise. More pertinently, reproductive functions have been reshuffled by financialization and the entrepreneurial rationality that has infiltrated state welfare schemes, imbuing everyday routines with the discipline and temporality of indebted life. This displacement of reproductive activity from the state in tandem with the state’s repositioning within the mixed constitution of “total capital” calls for a more extended analysis, which necessarily must confront a wide array of instances in which the shifting relations of state and capital take diverse and sometimes novel forms. This means taking stock of the latest developments and mutations in the world of capital, placing equal emphasis on and exploring the complicity of heterogeneous modes of extraction and the seemingly metaphysical qualities of abstraction today. The analysis of finance, logistics, and extraction we have pursued elsewhere allows us to shed light on a set of principles and logics that increasingly drive economic development well beyond these “sectors.”17 In these practices and domains we see the intertwining of harshly material aspects of extraction and the almost ethereal protocols, techniques, and algorithms that guide capital’s operations. We are convinced that this intertwining points to present capitalist conditions and rationalities that are quite distinct from the classical form of industrial capitalism and that states nowadays are compelled to come to terms with this emerging and globally extensive capitalist formation. The ways in which states adjust to these conditions are clearly heterogeneous, and thus a grounded observation of how states actually confront these circumstances must be a crucial element of any analytical and political appraisal of current state transformations. Such grounded observation will inevitably encounter issues of framing, location, articulation of state structures, and the need to negotiate the gaps and clashes between critical analysis and seeing like a state. It will also need to be informed by and contribute to the further elaboration of a theoretical perspective that reckons with the accumulation of capital, practices of daily life, the politics of geographical scale, and the state’s imbrication with the ruptures and antagonisms that crisscross social cooperation. We do not expect that such an approach to the state will conjure away a series of classical questions that have always haunted political debates – questions about the collective will, representation, participation, political pluralism, and the capacity of states to provide grounds for emancipation. Far from the vision of society without the state, these questions continue to be posed with regard to the state and thus are negotiated or displaced against the background it provides. Nonetheless, there is a need to take very seriously claims about the exhaustion of these categories before the emergence of powerful branches of state administration and governance that seem to operate independently of their supposed representative legitimation and guidance. Moreover, these branches of power are increasingly susceptible to forms and practices of corruption, resulting, on the one hand, from the direct influence of corporate actors, and on the other hand from the penetration of entrepreneurial logics into the state’s most routine workings. This is not to deny that the state’s capabilities can be effectively appropriated, waylaid, or negotiated to radical political ends. But the success of such maneuvers is entirely dependent on assemblages of power that exceed and enfold the state. In confronting such issues, it is therefore a political imperative not to overly trust the state or to act in state service. It is not a matter of opposing an abstract “state-phobia,” to remember a word used by Michel Foucault,18 to the state-philia that is widespread in not only mainstream discourses but also those strands of critical theory that claim a monopoly on the realistic reckoning with issues of power. Rather, a realistic observation of current trends and transformations across diverse spaces and scales demonstrates that the state is not powerful enough to confront the operations of global capital and thus to provide an effective framework for projects of radical transformation within and against contemporary capitalism. While the approach to the study of the state that we have sketched in this article highlights the relevant roles states continue to play in the present, it also stresses the structural limits that are imposed on their actions. There is a need for social movements and struggles to take stock of both sides of this predicament, inventing ways to confront the state capable of combining a tactical understanding of different political conjunctures with the capacity to materially open the horizon of a politics beyond the state. S02E034- Networks and undead institutions – the crisis of the state-form?